Tomorrow, you have the power to decide who will control Congress, Statehouses, and local governments across the nation. You have the POWER to cast your vote to protect good jobs, benefits and the union way of life. This election is crucial from key governor’s races and state representatives to members of Congress who could act to protect prevailing wages and our rights on the job or strip it all away. I know how hard you and your LIUNA brothers and sisters have been working this election: knocking on doors, making phone calls, sending text messages, and talking with friends and family. Let’s finish the job and take it to the polls tomorrow. Remember that your vote is your voice. Use your POWER and let our voices be heard. 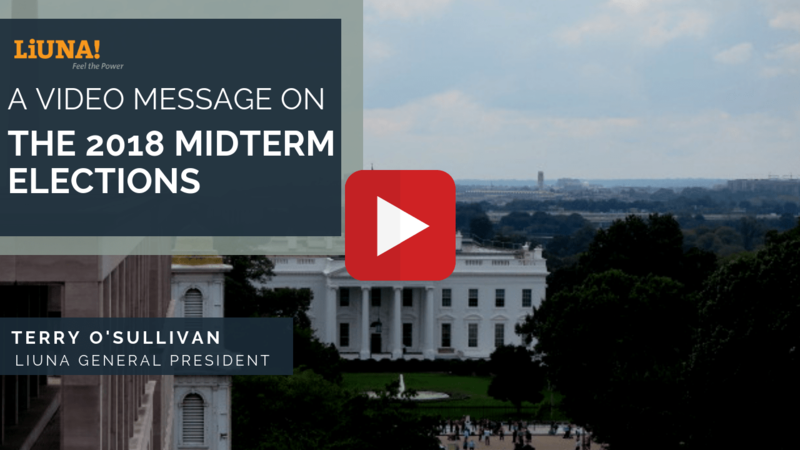 LIUNA General President Terry O’Sullivan with a Message on the election. Previous Previous post: One More Thing to Do! Next Next post: Give Yourselves a Hand!